PM #40762529 $5.00 • Vol. 29, No. 13 April 16, 2018 L AW TIMES C O V E R I N G O N T A R I O ' S L E G A L S C E N E • W W W . L A W T I M E S N E W S . C O M Assessments process still marred by delays Tanya Pagliaroli says extreme delays in the assessment process call into question its fairness and effectiveness. Photo: Robin Kuniski UNBUNDLED PROJECT Initiative will provide limited-scope services P4 MMIWG INQUIRY Hearings shouldn't be lawyer driven P7 FOCUS ON Class Action Law P8 www.twitter.com/lawtimes Follow TORONTO | BARRIE | HAMILTON | KITCHENER 1-866-685-3311 | mcleishorlando.com cLeish Orlando_LT_Jan_20_14.indd 1 14-01-15 3:15 PM FULL DAY IN-CLASS & LIVE ONLINE ACCESS CHAIRED BY Donald B. Johnston, Aird & Berlis LLP | Natasha Ell Saunders, Vice President, Legal Affairs, TekSavvy Solutions Inc. WWW.TECHLAW-CONFERENCE.CA 2018 TECHNOLOGY LAW SPRING FORUM MAY 28-29, 2018 Powered by REGISTER NOW Save 10% before April 30, 2018 Untitled-2 1 2018-04-11 9:42 AM BY ALEX ROBINSON Law Times A n Ontario judge has added his voice to a chorus of justices and lawyers calling on the provincial government to fix long delays at assessment offices. In Linett v. Aird & Berlis LLP, Ontario Superior Court Justice Patrick Monahan said the govern- ment should conduct a review of the process for assessing lawyers' accounts because of delays that are undermining public confidence in the administration of justice. "The legislature has been able to devise effective processes to resolve disputes arising between a wide variety of licensed profes- sionals and their clients in On- tario," Monahan wrote in the de- cision. "It would appear timely for the relevant authorities and deci- sion-makers to review the process for the assessment of solicitors' accounts so as to ensure that a similarly fair, effective and expedi- tious dispute resolution process is in place." The case concerned an appli- cation brought by a client, Mark Linett, to assess the accounts of law firm Aird & Berlis LLP. After more than five years of delay, the firm brought a motion to have the assessment application dismissed. Monahan found that the delay in the case was "inordinate" and that it had caused a substantial risk of "prejudice" to the law firm's abil- ity to prove the accounts. However, he said that the vast majority of the delay was attributable to the as- sessment officer rather than the parties themselves. He dismissed the firm's motion, allowing the assessment to contin- ue. He said the case raises "serious questions about the fairness and effectiveness of the current process for assessing solicitors' accounts in Ontario" and that there is a signifi- cant public interest in making sure this process is fair. "Not only is this important for the administration of justice, as well as for solicitors and their cli- ents, it is simply a matter of con- sumer protection," he says. Backlogs continue to plague the assessment office at the Su- perior Court in Toronto despite a commitment by Ontario Attorney General Yasir Naqvi almost two years ago to look into the issue to find solutions, say lawyers. 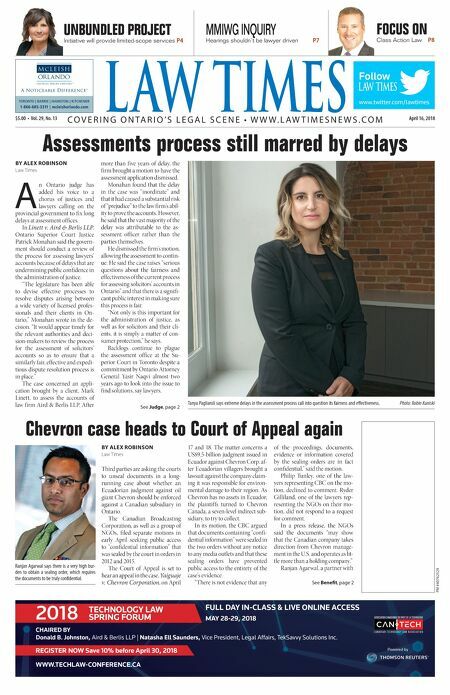 See Judge, page 2 Chevron case heads to Court of Appeal again BY ALEX ROBINSON Law Times Third parties are asking the courts to unseal documents in a long- running case about whether an Ecuadorian judgment against oil giant Chevron should be enforced against a Canadian subsidiary in Ontario. The Canadian Broadcasting Corporation, as well as a group of NGOs, filed separate motions in early April seeking public access to "confidential information" that was sealed by the court in orders in 2012 and 2015. The Court of Appeal is set to hear an appeal in the case, Yaiguaje v. Chevron Corporation, on April 17 and 18. The matter concerns a US$9.5-billion judgment issued in Ecuador against Chevron Corp. af- ter Ecuadorian villagers brought a lawsuit against the company claim- ing it was responsible for environ- mental damage to their region. As Chevron has no assets in Ecuador, the plaintiffs turned to Chevron Canada, a seven-level indirect sub- sidiary, to try to collect. In its motion, the CBC argued that documents containing "confi- dential information" were sealed in the two orders without any notice to any media outlets and that these sealing orders have prevented public access to the entirety of the case's evidence. "There is not evidence that any of the proceedings, documents, evidence or information covered by the sealing orders are in fact confidential," said the motion. Philip Tunley, one of the law- yers representing CBC on the mo- tion, declined to comment. Ryder Gilliland, one of the lawyers rep- resenting the NGOs on their mo- tion, did not respond to a request for comment. In a press release, the NGOs said the documents "may show that the Canadian company takes direction from Chevron manage- ment in the U.S. and operates as lit- tle more than a holding company." Ranjan Agarwal, a partner with See Benefit, page 2 Ranjan Agarwal says there is a very high bur- den to obtain a sealing order, which requires the documents to be truly confidential.